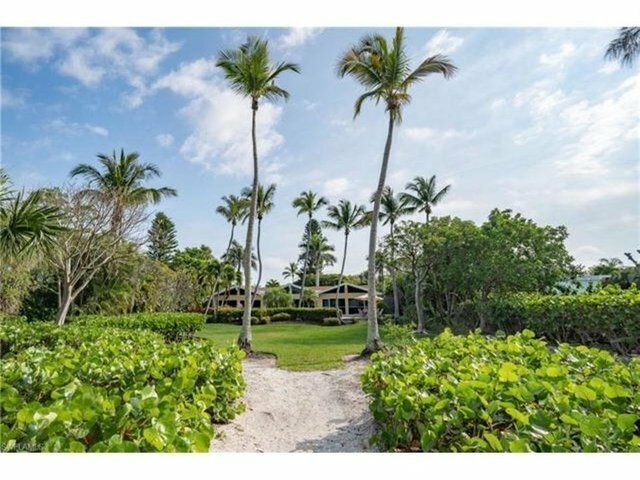 H.14401 - Angels Nest- A Gulf Front Setting incomparable to anything available on Sanibel right now. This coastal oasis with a mid-century modern feel boast nearly an acre of tranquil privacy in a garden like setting with a meandering path to the waters edge. The rear Chateau like elevation is complimented by a large pool and spa situated perfectly for sunset viewing. This stately neighborhood of Chateau Sur Mer offers just 70 home sites, casual elegance and privacy. This home provides the perfect setting for entertaining from the inviting main gathering areas, its Vaulted Cypress tong and groove ceiling, transom windows, 3 arches in the home, sliding doors from each room with Western exposure and chic furnishings to compliment for the ultimate Island retreat. This home grosses nearly $19,000 monthly in-season and in excess of $100,000 annually in its current rental program.